Dolphins are largely marine cetaceans (order Cetacea) with many teeth that belong to the "toothed whales" suborder Odontoceti, along with whales and porpoises, and they usually have a beaklike snout. (The other cetacean suborder is Mysticeti, the baleen whales.) There are freshwater representatives among these aquatic mammals. As with other mammals, cetaceans are warm-blooded, breathe air, have hair at least some stage in their development, and feed their young on milk. Dolphins all give birth to live young. Dolphins are considered to be among the most intelligent of animals, and their graceful movements, often friendly appearance, seemingly playful attitude, and reputation for often positive interactions with people have made them popular in human culture. On the other hand, the gap between human responsibility to care for nature and actual actions is evident in anthropogenic threats to dolphins, including being caught in fishermen's nets, being hit by propellers, and having their habitats damaged by pollution. All of the river dolphins are endangered. There is no strict definition of the term dolphin (Grzimek 2004) and distinguishing whales, dolphins, and porpoises among the Odontoceti is difficult. Body size is useful, but not a definitive distinction, with those cetaceans greater than 9 feet (2.8 meters) generally called whales; however, some "whales" are not that large and some dolphins can grow larger (Grzimek 2004). Scientifically, the term porpoise should be reserved for members of the family Phocoenidae, but historically has been often applied in common vernacular to any small cetacean (Grzimek 2004). Dolphin has been used either for members of the family Delphinidae or for any member of the families Delphinidae and Platanistoidea. It has also been used for any member of the Odontoceti, including the above families and some others. Dolphin is used casually as a synonym for bottlenose dolphin, the most common and familiar species of dolphin. 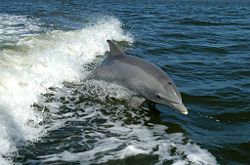 In this article, dolphin will refer to any member of Delphinidae (oceanic dolphins) and Platanistoidea (river dolphins). Porpoises (family Phocoenidae) are thus not dolphins in this sense. Orcas (killer whales) and some closely related species belong to the Delphinidae family and therefore qualify as dolphins, even though they are called whales in common language. There are almost 40 species of dolphin in 17 genera. They are found worldwide, mostly in the shallower seas of the continental shelves. Most species are marine, but the Amazon river dolphin (Inia geoffrensis), Chinese river dolphin (Lipotes vexillifer), Ganges river dolphin (Platanista gangetica), and Indus river dolphin (Platanista minor) inhabit exclusively freshwater environments. Dolphins vary in size from 1.2 meters (4 feet) and 40 kilograms (88 pounds) for Maui's dolphin up to 9.5 meters (30 feet) and ten metric tons for the orca. They are carnivores, mostly eating fish and squid. As with the other cetaceans, dolphins have a nearly hairless, fusiform (spindle-shaped) body with anterior limbs in the form of flippers, and a flat, notched tail with horizontal flukes that lacks bony support. The tiny hindlimbs are vestigial; they do not attach to the backbone and are hidden within the body. Like other members of the Odontoceti suborder, dolphins have only one blowhole and have the main bones of the upper jaw thrust upward and back over the eye sockets (Grzimek 2004). An outstanding ability of the Odontoceti is to sense their surrounding environment through echolocation. The family Delphinidae is the largest in the Cetacea, and is considered to be relatively recent, with dolphins appearing about ten million years ago, during the Miocene. Six species in the family Delphinidae are commonly called whales but strictly speaking are dolphins. They are sometimes called blackfish. A group of dolphins can be called a school or a pod. 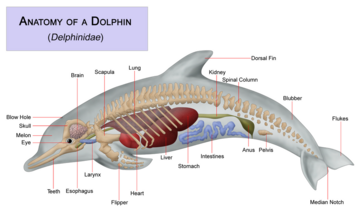 The anatomy of a dolphin, showing its skeleton, major organs, and body shape. Dolphins have a streamlined fusiform body, adapted for fast swimming. The basic coloration patterns are shades of gray with a light underside and a distinct dark cape on the back. It is often combined with lines and patches of different hue and contrast. The head contains the melon, a round organ used for echolocation. In many species, the jaws are elongated, forming a distinct beak; for some species like the bottlenose, there is a curved mouth which looks like a fixed smile. Teeth can be very numerous (up to 250 in several species). The dolphin brain is large and has a highly structured cortex, which often is referred to in discussions about their advanced intelligence. Unlike most mammals, dolphins do not have hair, but they are born with a few hairs around the tip of their rostrum, which they lose after some time, in some cases even before they are born. The only exception to this is the Boto river dolphin, which does have some small hairs on the rostrum. Bottlenose dolphin with vestigial hind flippers, captured 2006 in Japan. Modern dolphin skeletons have two small, rod-shaped pelvic bones thought to be vestigial hind legs. In October 2006, an unusual bottlenose dolphin was captured in Japan; it had small fins on each side of its genital slit, which scientists believe to be a more pronounced development of these vestigial hind legs (AP 2006). Most dolphins have acute eyesight, both in and out of the water. The out-of-water eyesight is helpful to dolphins to see ahead when they jump out of the water and even help in retrieving fish forced onto land by the dolphins, who then temporarily beach themselves to capture the fish (Wang et al. 1994). Dolphins sense of hearing is superior to that of humans. Though they have a small ear opening on each side of their head, it is believed that hearing underwater is also, if not exclusively, done with the lower jaw, which conducts the sound vibrations to the middle ear via a fat-filled cavity in the lower jaw bone. Hearing is also used for echolocation, which seems to be an ability all dolphins have. Their teeth are arranged in a way that works as an array or antenna to receive the incoming sound and make it easier for them to pinpoint the exact location of an object (Goodson and Klinowska 1990). The dolphin's sense of touch is also well-developed. However, dolphins lack an olfactory nerve and lobes and thus are believed to have no sense of smell (SeaWorld 2007), but they can taste and do show preferences for certain kinds of fish. Since dolphins spend most of their time below the surface, just tasting the water could act in a manner analogous to a sense of smell. Though most dolphins do not have any hair, they do still have hair follicles and it is believed these might still perform some sensory function, though it is unclear what exactly this may be (Mauck et al. 2000). The small hairs on the rostrum of the Boto river dolphin are believed to function as a tactile sense, however, possibly to compensate for the Boto's poor eyesight (Stepanek 1998). Dolphins are often regarded as one of Earth's most intelligent animals. However, it is hard to say just how intelligent dolphins are, as comparisons of species' relative intelligence are complicated by differences in sensory apparatus, response modes, and nature of cognition. Furthermore, the difficulty and expense of doing experimental work with large aquatics means that some tests that could meaningfully be done still have not been carried out, or have been carried out with inadequate sample size and methodology. Dolphin behavior has been studied extensively by humans, however, both in captivity and in the wild. 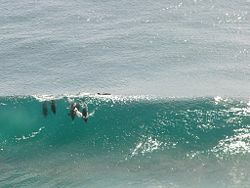 Dolphins surfing at Snapper Rocks, Queensland, Australia. Dolphins are social, living in pods ("schools") of up to a dozen individuals. In places with a high abundance of food, pods can join temporarily, forming an aggregation called a superpod; such groupings may exceed a thousand dolphins. The individuals communicate using a variety of clicks, whistles, and other vocalizations. They also use ultrasonic sounds for echolocation. Membership in pods is not rigid; interchange is common. However, the cetaceans can establish strong bonds between each other. This leads to them staying with injured or ill individuals for support. In May 2005, researchers in Australia discovered a cultural aspect of dolphin behavior: The species Tursiops aduncus was found to teach their young to use tools. The dolphins break sponges off and cover their snouts with them, thus protecting their snouts while foraging. This knowledge of how to use a tool is mostly transferred from mothers to daughters, unlike simian primates (monkeys and apes), where the knowledge is generally passed on to both sexes. The technology to use sponges as mouth protection is not genetically inherited but a taught behavior (Hooper 2005). Dolphins are one of the few animals other than humans known to mate for reasons other than reproduction. Male bottlenose dolphins are known to engage in sexual acts with other dolphin species, which is not always consensual, though the bottlenose may also be submissive in such encounters (National Geographic 1999). Samuels et al. (2003) reported that dolphins will also show sexual behavior towards humans. Dolphins are known to engage in acts of aggression towards each other. The older a male dolphin is, the more likely his body is covered with scars ranging in depth from teeth marks made by other dolphins. It is suggested that male dolphins engage in such acts of aggression due to disputes between companions or even competition for other females. Acts of aggression can become so intense that targeted dolphins are known to go into exile, leaving their communities as a result of losing a fight with other dolphins. Male bottlenose dolphins have been known to engage in infanticide. Dolphins have also been known to kill porpoises for reasons that are not fully understood, as porpoises generally do not share the same fish diet as dolphins and are therefore not competitors for food supplies (Johnson 2006). Dolphins are willing to occasionally approach humans and playfully interact with them in the water. In return, some human cultures, such as the Ancient Greeks, treated them with welcome; a ship spotting dolphins riding in their wake was considered a good omen for a smooth voyage. There are stories of dolphins protecting swimmers against sharks by swimming circles around them (CBC 2004). Individual species may employ a number of methods of hunting. One such method is herding, where a superpod will control a school of fish, while individual members take turns plowing through the herd, feeding. The tightly packed school of fish is commonly known as bait ball. Coralling is a method where fish are chased to shallow water where they are more easily captured. In South Carolina, Atlantic bottlenose dolphins were observed that took this one step further in a process that has been called strand feeding (Wang et al. 1994). In this case, fish are driven onto mud banks and retrieved from there, the dolphins beaching themselves in order to retrieve the fish, before wiggling back into the water. In some places, orcas will also come up to the beach to capture seals. Some species also whack fish with their fluke, stunning them and sometimes sending fish clear out of the water. Reports of cooperative human–dolphin fisheries date back to Pliny. A modern human–dolphin fishery, where dolphins literally herd shoals of fish into the nets of fishermen, still takes place in Laguna, Santa Catarina, Brazil, as well as in parts of West Africa (Telegraph 2006). Dolphins often leap above the water surface, sometimes performing acrobatic figures (e.g. the spinner dolphin). Scientists are not always quite certain about the purpose of this behavior and the reason for it may vary. It could be to locate schools of fish by looking at above-water signs, like feeding birds; they could be communicating to other dolphins to join a hunt; they may be attempting to dislodge parasites; or they simply may be doing it for fun. Play is a very important part of dolphins' lives, and they can often be observed playing with seaweed or play-fighting with other dolphins. They even harass other locals, like seabirds and turtles. Dolphins also seem to enjoy riding waves and frequently “surf” coastal swells and the bow waves of boats. Dolphins have long played a role in human culture. Dolphins are common in Greek mythology. There also are many coins from ancient Greece that feature a man or boy riding on the back of a dolphin. Dolphins also seem to have been important to the Minoans, judging by artistic evidence from the ruined palace at Knossos. In Hindu mythology, the Ganges river dolphin is associated with Ganga, the deity of the Ganges River. 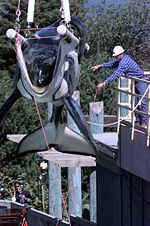 The famous orca Keiko from the Free Willy movies being prepared for transport. In modern times, the 1963 Flipper movie and the subsequent popular Flipper television series, contributed to the popularity of dolphins in Western society. The series portrayed a bottlenose dolphin, Flipper, in a friendly relationship with two boys. A second Flipper movie was made in 1996, and a bottlenose dolphin also played a prominent role in the 1990s science fiction television series seaQuest DSV. 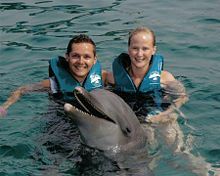 A young couple being entertained by a trained bottlenose dolphin in Puerto Plata, Dominican Republic. 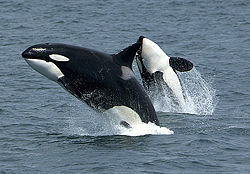 Better known from this time period is probably the movie Free Willy, which made famous the orca playing Willy, Keiko. Other movies, such as 1977 horror movie Orca and the 1973 The Day of the Dolphin, painted a less friendly picture of these species. The renewed popularity of dolphins in the 1960s resulted in the appearance of many dolphinariums around the world, which have made dolphins accessible to the public. Though criticism and more strict animal welfare laws have forced many dolphinariums to close their doors, hundreds still exist around the world, attracting large amounts of visitors. In the United States, best known are the SeaWorld marine mammal parks, and their common orca stage name Shamu, which they have trademarked, has become well known. Southwest Airlines, an American airline, has even painted three of their Boeing 737 aircraft in Shamu colors as an advertisement for the parks and have been flying with such a livery on various aircraft since 1988. A number of militaries have employed dolphins for various purposes from finding mines to rescuing lost or trapped humans. Such military dolphins, however, drew scrutiny during the Vietnam War when rumors circulated that dolphins were being trained to kill Vietnamese skin divers. Best known today is the U.S. Navy Marine Mammal Program. Dolphins are also common in contemporary literature, especially science fiction novels. A military role for dolphins is found in William Gibson's short story Johnny Mnemonic, in which cyborg dolphins are used in wartime by the military to find submarines and, after the war, by a group of revolutionaries to decode encrypted information. More humorous is The Hitchhiker's Guide to the Galaxy, in which dolphins are the second-most intelligent creatures on Earth, after mice, and try in vain to warn humans of the impending destruction of the planet. However, their behavior was misinterpreted as playful acrobatics. Their story is told in one of the books of that series, So Long, and Thanks for All the Fish. Much more serious is their major role (along with chimpanzees) in David Brin's Uplift series. Dolphins also appear frequently in non-science fiction literature. In the book The Music of Dolphins by author Karen Hesse, a girl is raised by dolphins from the age of four until she is discovered by the coast guard. Fantasy author Ken Grimwood wrote dolphins into his 1995 novel Into the Deep about a marine biologist struggling to crack the code of dolphin intelligence, including entire chapters written from the viewpoint of his dolphin characters. 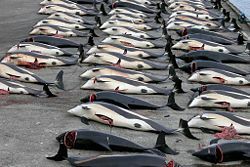 Dead Atlantic white-sided dolphins in Hvalba on the Faroe Islands, killed in a drive hunt. Some dolphin species face an uncertain future, especially some of the river dolphin species such as the Amazon river dolphin, and the Ganges and Yangtze river dolphins, all of which are critically or seriously endangered. 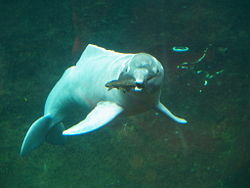 A 2006 survey found no individuals of the Yangtze river dolphin, leading to the conclusion that the species is now functionally extinct (Williams 2006). Contamination of the environment—the oceans, seas, and rivers—is an issue of concern, especially pesticide, heavy metals, plastics, and other industrial and agricultural pollutants that do not disintegrate rapidly in the environment. These are reducing dolphin populations, and resulting in dolphins building up unusually high levels of contaminants. Injuries or deaths due to collisions with boats, especially with propellers, are also common. 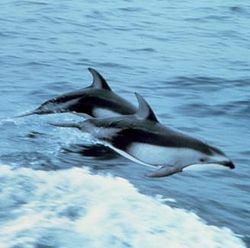 Various fishing methods, most notably purse seine fishing for tuna and the use of drift and gill nets, results in a large amounts of dolphins being killed inadvertently (Clover 2004). Accidental by-catch in trout nets is common and poses a risk for mainly local dolphin populations. In some parts of the world, such as some areas in Japan and the Faroe Islands, dolphins are traditionally considered as food, and killed in harpoon or drive hunts. In 1933, three abnormal dolphins were beached off the Irish coast; these appeared to be hybrids between Risso's dolphin and the bottlenose dolphin (Dolphin Safari 2006). This mating has since been repeated in captivity and a hybrid calf was born. In captivity, a bottlenose dolphin and a rough-toothed dolphin produced hybrid offspring (NSRL 1997). A common–bottlenose hybrid lives at SeaWorld, California. 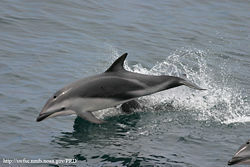 Various other dolphin hybrids have also been reported in the wild, such as a bottlenose–Atlantic spotted hybrid (Herzing 2003). The best known hybrid, however, is the Wolphin, a false killer whale–bottlenose dolphin hybrid. The Wolphin is a fertile hybrid, and two such Wolphins currently live at the Sea Life Park in Hawaii, the first having been born in 1985 from a male false killer whale and a female bottlenose. Associated Press (AP). 2006. Japanese researchers find dolphin with "remains of legs." Fox News, November 6, 2006. Retrieved March 24, 2007. CBC News. 2004. Dolphins save swimmers from shark. CBC News. Retrieved March 11, 2007. Clover, C. 2004. The End of the Line: How Overfishing is Changing the World and What We Eat. London: Ebury Press. ISBN 0091897807. Dolphin Safari. 2006. 2006 Sightings Log. Dolphin Safari. Retrieved December 17, 2006. Goodson, A. D., and M. Klinowska. 1990. A proposed echolocation receptor for the Bottlenose Dolphin (Tursiops truncatus): Modeling the receive directivity from tooth and lower jaw geometry. In Sensory Abilities of Cetaceans: Laboratory and Field Evidence, by J. A. Thomas and R. A. Kastelein. New York: Plenum Press. ISBN 0306436957. Herzing, D. L., K. Moewe, and B. J. Brunnick. 2003. Interspecies interactions between Atlantic spotted dolphins, Stenella frontalis and bottlenose dolphins, Tursiops truncatus, on Great Bahama Bank, Bahamas. Aquatic Mammals 29(3): 335–41. Retrieved March 25, 2007. Hooper, R. 2005. Dolphins teach their children to use sponges. New Scientist, June 6, 2005. Retrieved December 17, 2006. Johnson, G. 2006. Is flipper a senseless killer? On Science. Retrieved December 17, 2006. Mauck, B., U. Eysel, and G. Dehnhardt. 2000. Selective heating of vibrissal follicles in seals (Phoca vitulina) and dolphins (Sotalia fuviatilis guianensis). Journal of Experimental Biology 203: 2125–31. Retrieved March 11, 2007. National Geographic. 1999. National Geographic Television Exposes the Dark Side of Dolphins in New National Geographic Special "Dolphins: The Wild Side." NationalGeographic.com. Retrieved March 25, 2007. National Science Research Laboratory (NSRL), Texas Tech University. 1997. Mammals of Texas: Rough-toothed Dolphin. Texas Tech University. Retrieved December 8, 2006. Robin's Island. 2007. Database about captive dolphins and whales. Robins-island.org. Retrieved December 17, 2006. Samuels, A., L. Bejder, R. Constantine, and S. Heinrich. 2003. Chapter 14: Swimming with wild cetaceans in the Southern Hemisphere. Marine Mammals: Fisheries, Tourism and Management Issues, 266–68. Retrieved December 17, 2006. SeaWorld. 2007. Bottlenose Dolphins: Senses. SeaWorld. Retrieved December 17, 2006. Stepanek, L. 1998. Species Corner: Amazon River Dolphin (Inia geoffrensis). Texas Marine Mammal Stranding Network. Retrieved March 11, 2007. Telegraph. 2006. Brazil's sexiest secret. Telegraph, August 3, 2006. Retrieved March 11, 2007. Wang, K. R., P. M. Payne, and V. G. Thayer, comps. 1994. Coastal stock(s) of Atlantic Bottlenose Dolphin: Status review and management. Proceedings and Recommendations from a Workshop held in Beaufort, North Carolina, 13–14 September 1993. U.S. Department of Commerce, National Oceanic and Atmospheric Administration, National Marine Fisheries Service. Retrieved March 25, 2007. Williams, D. 2006. Yangtze dolphin may be extinct. Shanghai Daily. Retrieved December 9, 2006. The Whale & Dolphin Conservation Society (WDCS). Red Sea Spinner Dolphin – Photo gallery. Images of Wild Dolphins in the Red Sea. This page was last modified on 16 October 2017, at 19:34.